It is copyright © Don Share and Jacket magazine 2007.
perhaps, the essence of the thing itself. who by nature leave behind essential drool. You can’t fool a dog with your crumbs. That’s the heart of it, the meat of it. What you toss they’ll jaw up well. or me, needing no mind behind the mind. that foreboding is worth something. of which I am not a virtuous man. Dogs don’t converse while they eat. We say grace, clink glasses, drink the wine. Where there’s a will, evidently there’s ... a will. 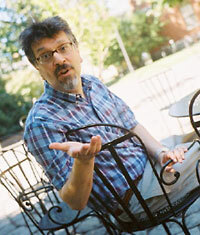 Don Share is Curator of the Poetry Room at Harvard University, where he teaches, and is Poetry Editor of ‘Harvard Review’; he is also Editor of ‘Literary Imagination’: the Review of the Association of Literary Scholars and Critics. His most recent book is Squandermania (Salt Publishing). Other books include Union (Zoo Press), shortlisted for the PEN-New England Winship Award and the Walt Whitman Award of the Academy of American Poets; Seneca in English (Penguin Classics); I Have Lots of Heart: Selected Poems of Miguel Hernández (Bloodaxe Books), which received the Times Literary Supplement/Society of Authors Translation Prize; and a critical edition of Basil Bunting, forthcoming from Faber and Faber.